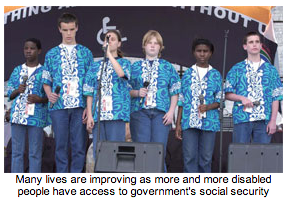 The lives of people with disabilities and their families have improved during the last 14 years. 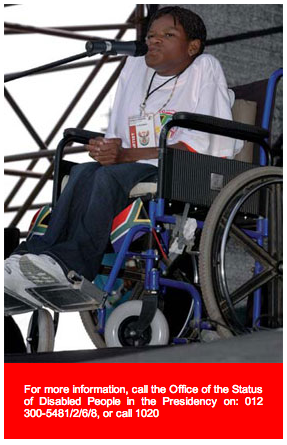 This was noted during the second two-day National Disability Summit in Johannesburg in July. The theme was "Justice and Dignity for All ." More than 300 representatives from different organisations for disabled people, as well as government bodies attended the Disability Summit. The Office of the Status of Disabled People in the Presidency and the South African Disability Alliance organised the summit. Representatives said they had noticedthat the public have generally become more positive about disabled people. In addition, more and more disabled people have access to government's social services and basic care. The number of people with disabilities who benefit from disability grants has grown from 634 000 in 1999 to 1,5 billion in 2007. This increase has helped to reduce poverty among disabled people. One of the agreements reached at the summit was that a national awareness plan on disability would be developed. The plan will give guidance to those who work with disabled people to make sure they have a common goal. It will also make sure disabled people are treated with respect and dignity. All government departments must develop guidelines to make sure disabled people have access to information, transport and other services. The guidelines will be developed with the help of the South African Disability Alliance. The summit noted that the target of two per cent of public service jobs set aside for disabled people has not yet been reached. Government will make sure that employers are encouraged to cooperate by giving jobs to disabled people. It was recommended that the work of Sector Education and Training Authorities (SETAs) should include all matters relating to disabled people. This will help to empower them by creating jobs.